I sat down and went over my income and all of my bills, and realized that I could have afforded all of my bills with no extra income. Then I realized that all of the extra money that I had been making could have been used in other areas. I looked back at all of the years that I had wasted working all day, and had nothing to show for it. So I came up with a plan to continue to work a part time, but with a purpose. Being that I didn't have to have a part time to pay my bills, I quite my part time job and starting working a very part time job, and my body is thanking me. Savings - I have an emergency savings that's funded by my fulltime job, but I also use a portion of my part time to add to it. You can never have enough money saved for a rainy day. Travel - Everybody likes to go on vacations or even weekend getaways, what better way to use your part time job than to save up for a cruise. Investing - Lets be for real, who get's wealthy by saving, you need to invest your money so that it can work for you. I personally invest a small amount of money to the stock market. It is a bit risky, but with the right knowledge and understanding, you can really see some good money in the long run. You might want to invest in real estate or a business of your own. Debts - Now this is probably the most important of them all!! Most people have debts so deep that they couldn't even dream of paying them off. 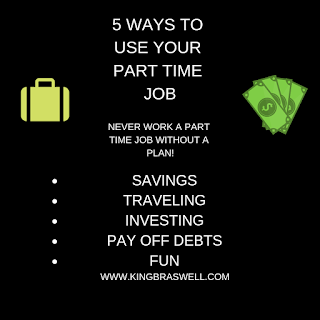 This is where the part time comes in at, you get out of debt, your credit score shoots up, and you will be able to put your hands on even more money. Fun - Yep you read it, good old having some drinks, smoking some cigars, and entertaining friends fun. No one wants to work all day and not have any fun or entertainment. Stash some of that extra money away for that concert that you wanted to see, that new restaurant you want to eat at, or that happy hour spot down the street from your house. 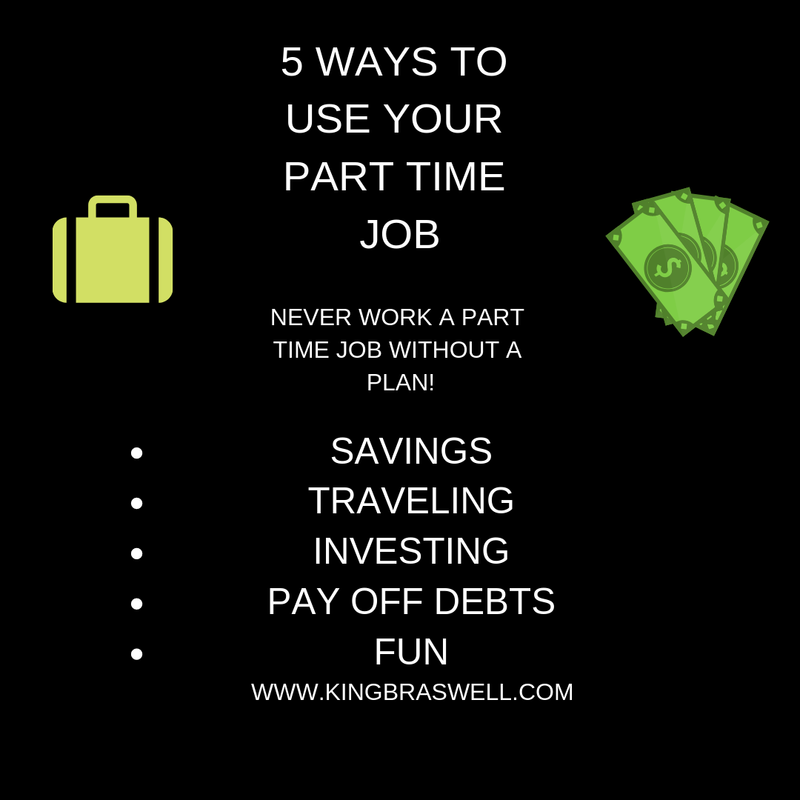 I currently use my part time job for all of the 5 areas listed, and my life has changed dramatically in a short period of time. My new way of living has really opened up my eyes and shown me were I could be right now if I had done this earlier. I hope that you will be able to use this info, and please give me feedback if you decide to take my advice. Remember, if you need any help and find out exactly how I budget, shoot me an email. Happy Saving!! !